Our exclusive Driftwood Trees are made here by our in House Artisans. 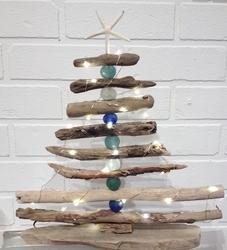 This Driftwood Tree has blue, green and white Seaglass Beads. These are all made by hand from local Driftwood found on the Beach.These trees are available with our mini lights too! Each Tree is made by hand so no two are alike. Please use the drop down menu to make your size selection. Trees measure 11-14 inches in width and height.